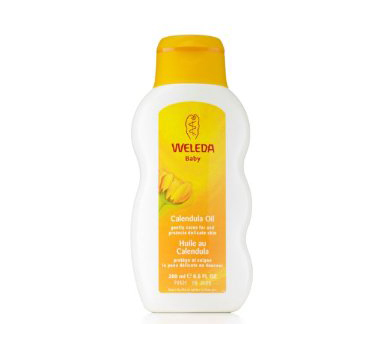 Pure, soothing Calendula Oil is an ideal natural product to assist in the daily care of babies' and young children's delicate skin. Its moisturising and gentle warming qualities leave the skin feeling soft and supple. Use for baby massage, all over moisturising, and add to baby's bath. A gentle way to cleanse the nappy area. As a mild massage oil it can be used on all parts of the body by people of all ages. Marigold (Calendula officinalis): Soothing and healing properties. German Chamomile (Matricaria recutita): Soothing and healing properties. Sweet Almond Oil: Natural vegetable oils to moisturise and protect delicate skin. Warm a small amount of oil in hands and using smooth, rhythmical movements gently massage over the body and limbs after a bath. Use after nappy changes to cleanse and protect. Prunus Amygdalus Dulcis (Sweet Almond), Calendula Officinalis, Chamomilla Recutita (Matricaria), Fragrance (Parfum)*, Limonene*, Linalool*, Geraniol*.